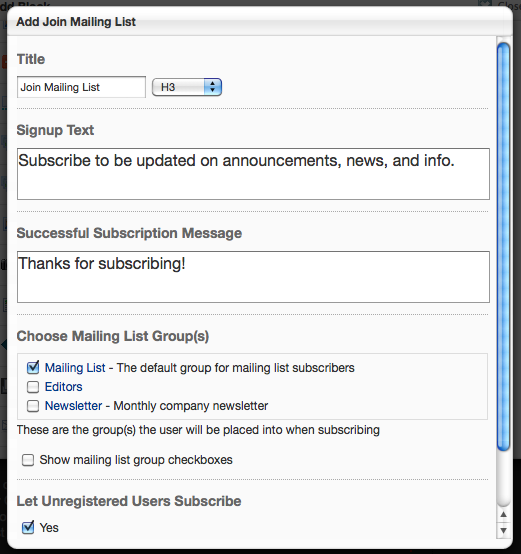 The mailing list package allows you to send emails & newsletters to any group, and allows your users to easily subscribe and unsubscribe. And unlike most other mailing list systems, the Mailing List package integrates well with your concrete5 site, and doesn't require that you pay a recurring monthly fee. 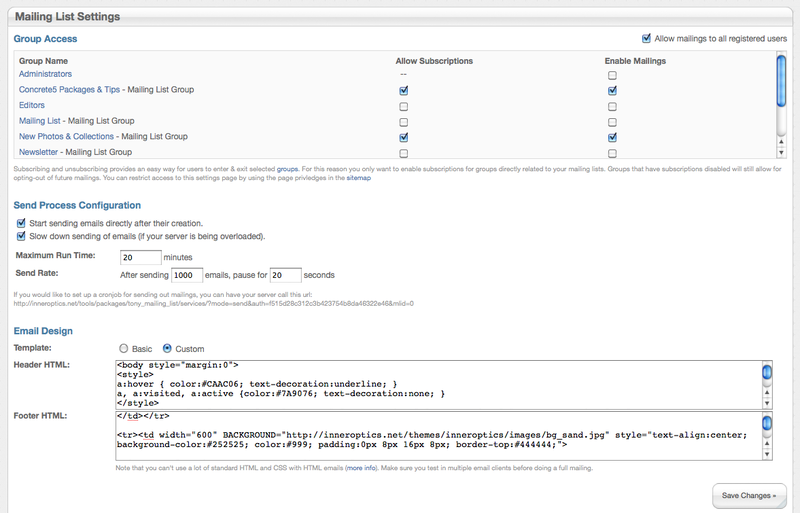 A Manage Subscriptions page, where users can cancel subscriptions, or optionally verify their email addresses when subscribing. Send Rich-Text / HTML emails directly from your website's dashboard, and have a plain text version auto-generated. Automatically include unsubscribe text & links with each email. Works with both regsitered and unregistered users! You can optionally require that only registered users may subscribe. When sending to thousands of recipients, you can slow the send rate of mailing so your server doesn't get bogged down. If the send process is interrupted for any reason, easily resume sending where it stopped. 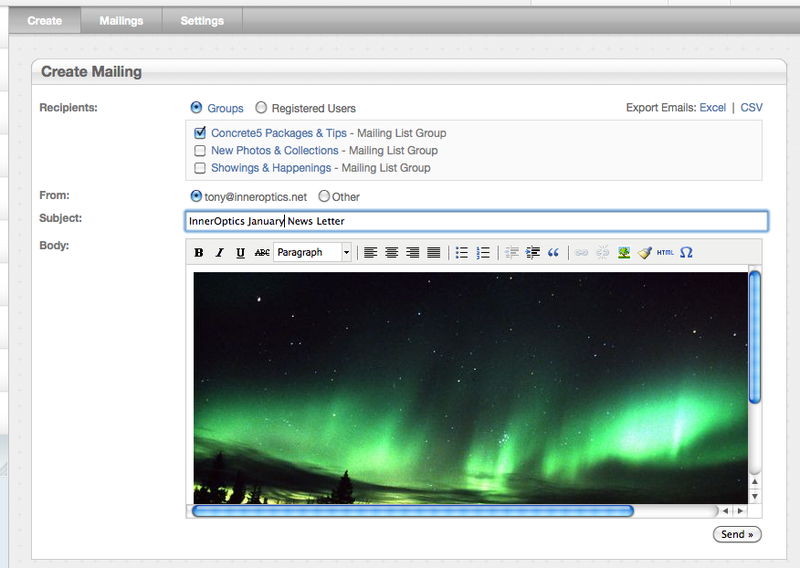 Enter your own header and footer HTML, to customize the look of your emails. Export recipient lists in Excel or CSV format. 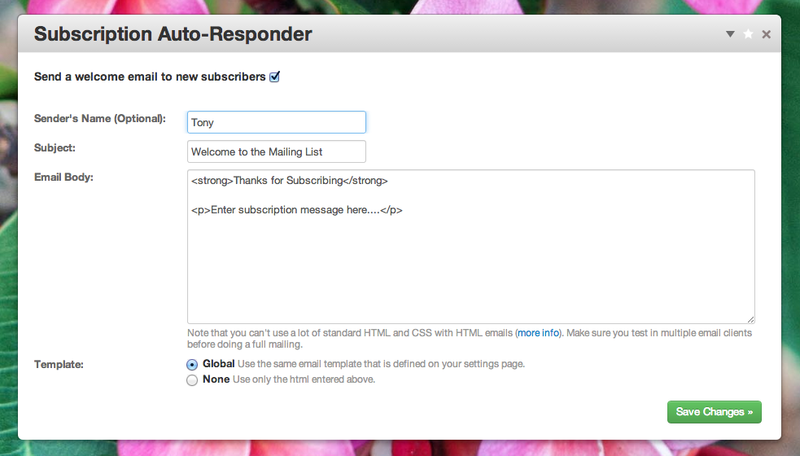 *New* If you already have a database of mailing list subscriber emails, you can easily import them. *New* Collect and include user attributes, like first and last name, in your mailings! 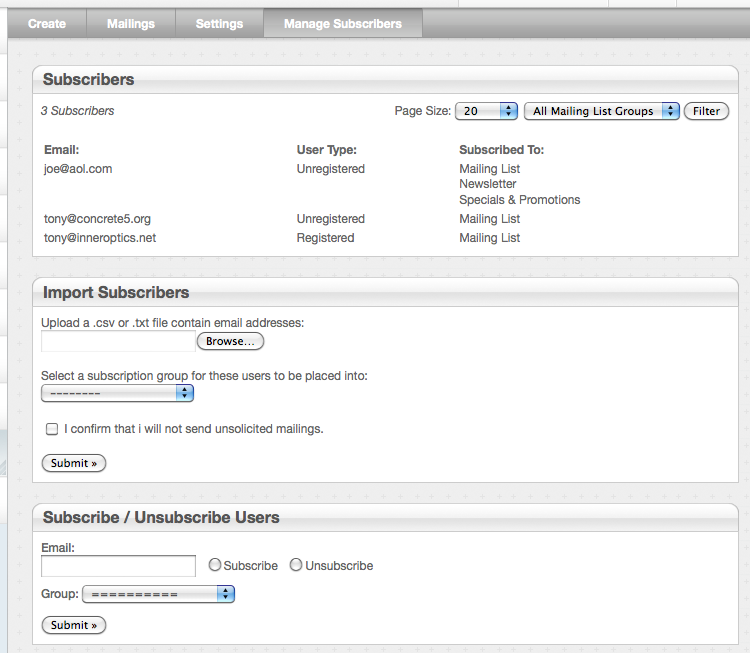 *New* View details on user unsubscriptions. Note: Sending large volumes of bulk mail can create both technical and legal challenges. If you're using this to send out lots of messages, you should make sure your hosting company allows it, and you should make sure the list of emails complies with your local spam control laws. Also, if for some reason emails get flagged as spam or are not recieved, chances are it's going to be related to either your concrete5 core & server configurations, not the mailing list package itself. I'll help you troubleshoot any issues you have up to the point where the emails are sent and logged in the reports page. If you still have any issues beyond that try enabling SMTP emails via the dashboard, setting up a SPF DNS record, and/or making sure the from email address is from the same domain as your mail server. However, for most installations these additional steps are unnecessary. If you get stuck more information and troubleshooting assistance is available here.